Mission for Vision took a team of 10 to Mozambique where they carried out clinics in Nwachicoluane located in the Chokwe district. The team consisted of 3 optometrists, 2 dispensers and 5 volunteers who carried out screening, and auto-refracting. Dispensing: Readers 900: Distance 230: 55 of the Mission for Vision specs for complex prescriptions: 760 Sunglasses were given. This trip was different to the others we have done in the sense that we concentrated our efforts in just one location, which was the same village we were staying: Nwachicoluane (meaning lady with a long neck). Even though our travelling and setting up time was reduced it was still a challenge to get through all the people but it was satisfying to know that at the end of the mission not too many people were turned away. A local nurse had made some preparations before our arrival, registering people with visual problems and these were given priority on our arrival. By the end of the week we had seen just under 1000 people and nearly all of them required treatment or glasses. 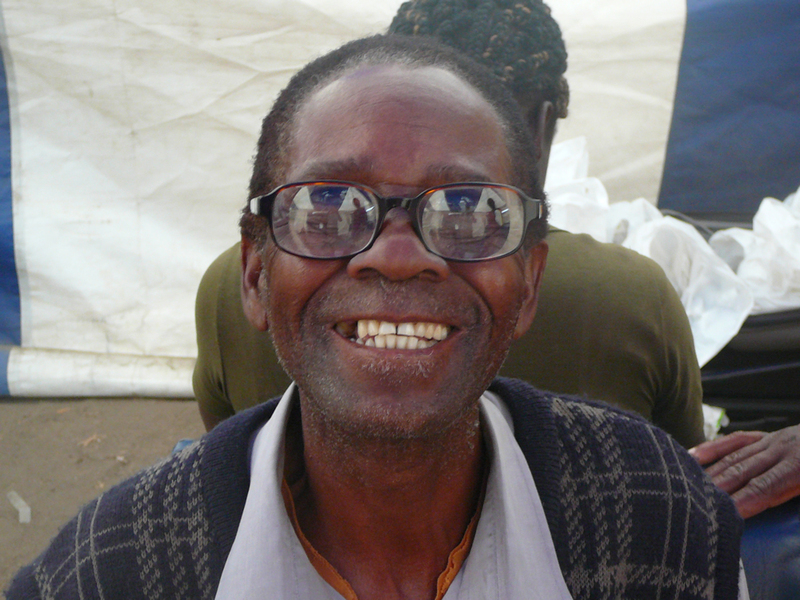 We were unable to fund too many cataracts in Mozambique due to the procedures there. They wait until the person is virtually blind before operating but we did eventually register seven patients to have the operation. For the first time a frame and lens system designed for Mission for Vision was employed to correct the more complex refractive errors and this proved to be very successful. Although the frames were not fashionable they were well received once the visual benefits were realised. Fifty five of these glasses were dispensed along with three hundred or so glasses for distance vision and nearly a thousand readers. We employed a local nurse to administer medication and register other patients who suffered from trachoma and glaucoma. Due to uncertainties regarding taking medical devices in to the country, it was decided it would be safer to enter the country by land and so the team flew to Johannesburg and then drove the 12 hour journey to Nwachicoluane, stopping overnight at the border. On the return journey the team was treated to a visit to the Kruger National Park which offered some spectacular sightings of the wildlife there. As always I would like to thank the team and their sponsors for all the hard work and generous donations given which enabled us to really make a difference and improve the lives of many. Thank You! ©Mission for Vision. All rights reserved.